Penn State grad student Nick Triozzi posted fliers all over town after his jacket, which had belonged to his late father, went missing after a Friday night out. His flier worked and the jacket was returned. STATE COLLEGE — Nick Triozzi knows that he shouldn’t have left his leather jacket in a pile with other coats at the Shandygaff last Friday night, Nov. 30. The jacket is special to him. It is more than just a jacket, it is a memory. It belonged to his father, who passed away in September from cancer. The jacket is a reminder of his dad and how much he meant to him, and Triozzi knows he shouldn’t have left it where someone could take it. He said he used to wear the jacket when he rode motorcycles with his dad. Triozzi said he found his scarf at the end of the night, but no jacket. Later, he found a vest and hat that he had left in the coat on the street outside of the bar. He said he believed that whoever took it did so by accident. “That coat is older than I am, and I hoped to have it forever and someday be able to give it to my own kid,” Triozzi said on Dec. 3. So, after the jacket went missing, he took action. He posted fliers around town offering a cash reward for the return of his coat. He spoke with police. He just wanted the jacket back and all the memories that came with it. “This jacket was my father’s. He passed away in September and it is all I have. Please return it to me. You will be forgiven,” read the fliers posted on lampposts around town. And then, remarkably he got a call. It seems a young woman left that night wearing his jacket. Her friend saw the flier and she was brave enough to call and return the jacket. According to Triozzi, the woman said she wasn’t wearing a coat when she went out that night and he thinks that she took it to stay warm on the journey home. He said he is glad that she returned the coat, because there was footage of the woman and her friend with the jacket and he believes the police would have found them otherwise. He said he offered the woman a cash reward for returning the jacket, but she refused to take it and apologized. “I’m really happy the person came forward and returned it. Maybe my dad was trying to teach me a lesson about taking care of my belongings and being alert. I don’t know,” said Triozzi. He took all his fliers down after warnings of a fine, but he is glad that they worked as fast as they did. Triozzi is leaving town next week to study overseas and he is glad to take the jacket along with him. 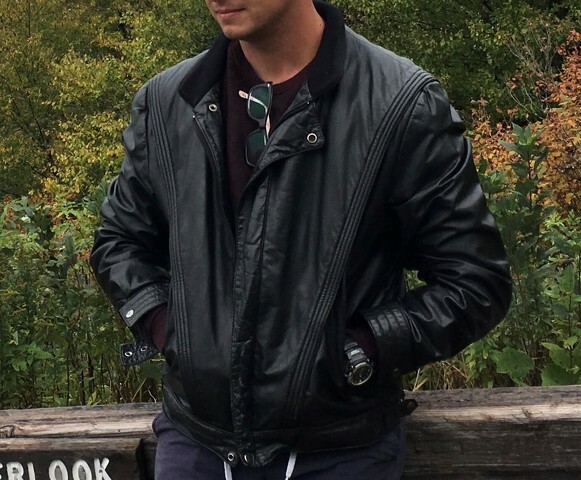 He is an anthropology student studying to be an archeologist and he said, “I feel every archeologist needs a leather jacket.” He said he is going to keep a close eye on his jacket from now on.